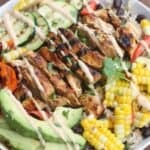 BBQ Ranch Gilled Chicken and Veggie Bowls served over black bean rice with delicious grilled veggies, marinated and grilled chicken, and a delicious Hidden Valley® Honey BBQ Ranch® Dressing. But one thing is always certain: once the warm weather rolls in I rely heavily on our barbecue for making dinner. Everything tastes better with that smokey, “fresh off the grill” taste. I usually keep it simple by marinating chicken in something simple like BBQ sauce or Italian dressing. But one of our new favorites is marinating chicken in one of the Hidden Valley® new dressing flavors. Have you seen them at your local store? They have Cilantro Lime Ranch, Buffalo Ranch, Sriracha Ranch and Honey BBQ Ranch. Every single flavor is bold and DELICIOUS. 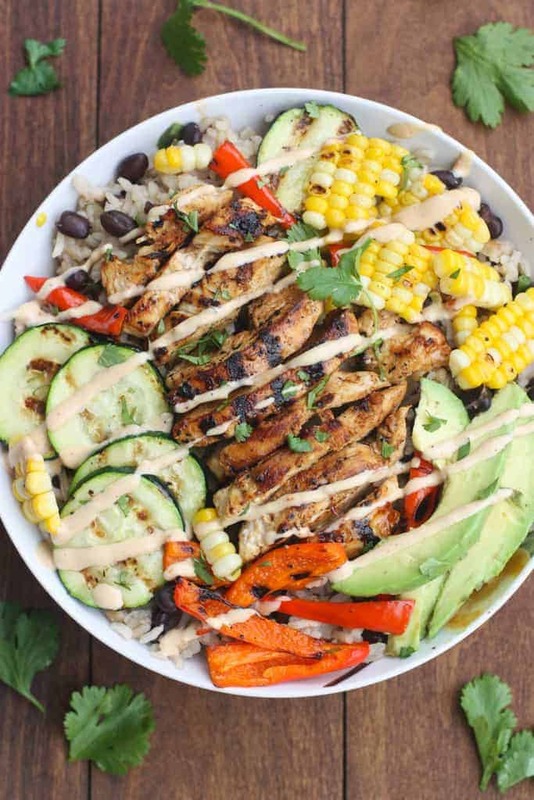 I recently used the Hidden Valley® Honey BBQ Ranch® Dressing flavor to make these delicious BBQ Ranch Grilled Chicken and Veggie Bowls. These all-in-one dinner bowls got rave reviews from my family. The sauce adds just the punch of flavor needed to take them from ordinary to awesome. My husband already requested that they make a regular appearance on our dinner menu. Another great part about this meal is that you can prep most of it in advance, so that dinner can be ready in a flash! Marinate the chicken ahead of time and stick it in the fridge. Chop all of the veggies ahead of time so that they’re ready to grill. Make the rice ahead of time and reheat it, if you want. You wont be disappointed by the end result of this easy, flavorful, veggie-packed dinner. Add oil to a saucepan over medium heat. Add chopped onion and rice and saute, stirring frequently, for 3-5 minutes or until rice begins to get golden brown. Add cumin, chicken broth and black beans. Bring to a boil, reduce heat to low, cover and cook for 20 minutes. 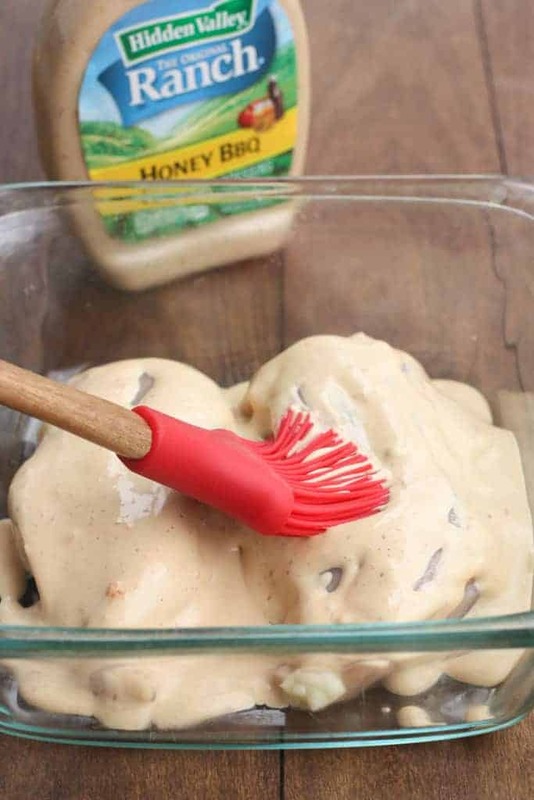 Meanwhile, place chicken in a shallow dish and baste with 1 heaping cup of Hidden Valley Honey BBQ Ranch Dressing. To grill the zucchini and bell peppers you can use a grill basket and cook them over medium heat on the grill, or use a grill pan on the stove. You can also cook the ears of corn on the grill (instructions here), or on the grill pan on the stove. 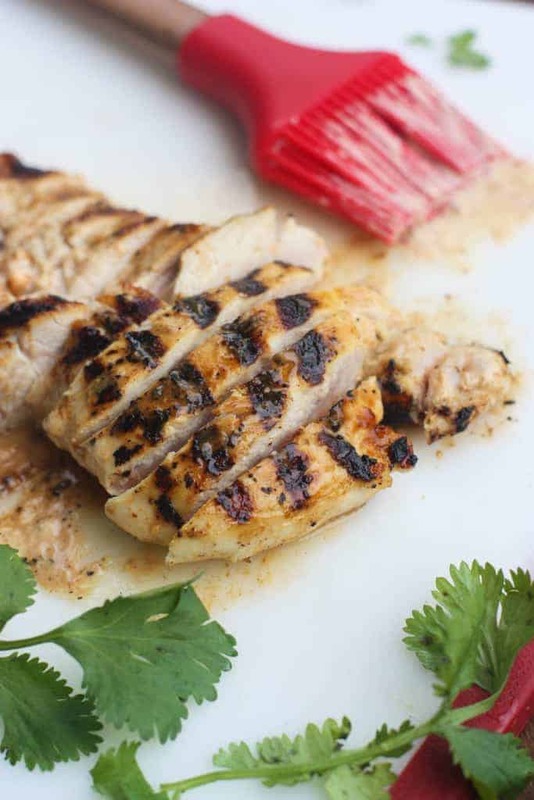 After the veggies are cooked, add the marinated chicken to the grill over medium heat. Cook for several minutes, flipping once, until cooked through. Remove to a plate to rest for 5 minutes before cutting. Spoon cooked rice into bowls. 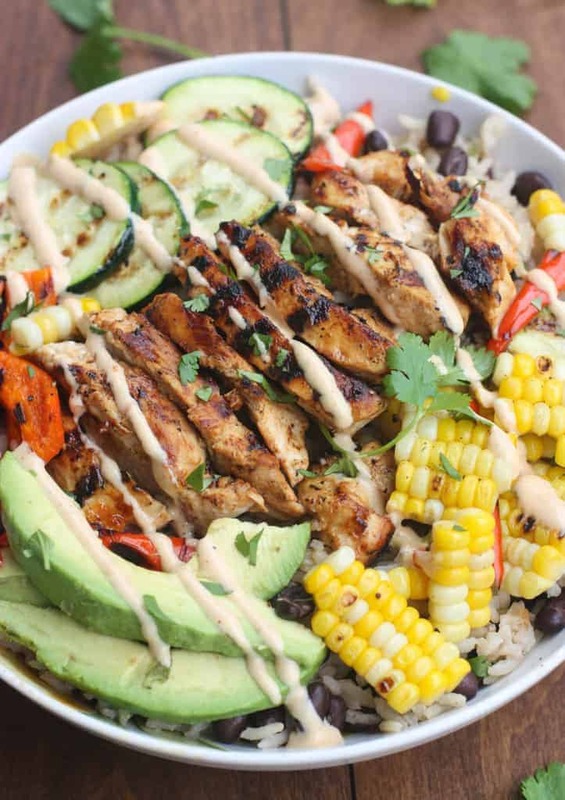 Top with chopped, cooked chicken, grilled zucchini, bell peppers, corn and sliced avocado. Drizzle Honey BBQ Ranch Sauce on top. Garnish with fresh cilantro, if desired. 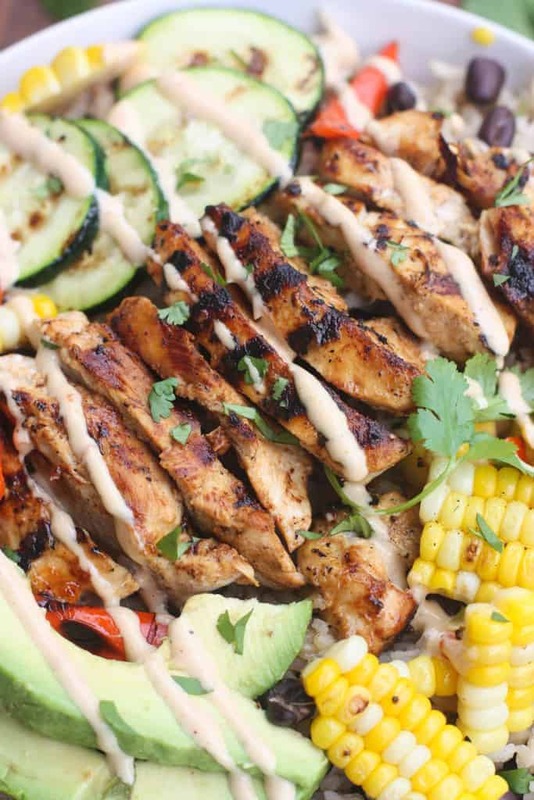 You might also like these Honey Lime Chipotle Chicken Fajita Bowls!